Yogyakarta Palace did conservation and restoration of his collection of paintings. The restoration was carried out on two oil paintings by Raden Saleh Boestaman, namely the paintings of Sri Sultan Hamengku Buwono VI and his queen's paintings, GKR Hageng. The conservation and restoration process in the two paintings was carried out during January and February 2019. Raden Saleh was a Javanese native who lived in the 19th century. His amazing talent in painting made him get a scholarship from the Dutch government to study painting in Europe. He became the first Javanese to master modern painting. He is known in the elite of Europe through his extraordinary paintings and appearance that combine Javanese and European fashion. In the mid 1860s he returned to Java and began to establish relations with the nobles of the Yogyakarta palace. In 1867 he settled in Yogyakarta for two years and married Raden Ayu Danudirja, a cousin of Sri Sultan Hamengku Buwono VI. Two restored paintings were chosen from four Raden Saleh paintings on display at the Yogyakarta Palace Painting Museum. Restoration is done not only on paintings, but also on frames and spiers. This is done because the frame decorated with a crown on the top has its own value, while the spanram used is very rare in Indonesia because it uses a knock down system. 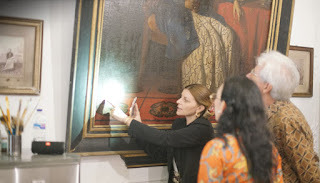 GKR Bendara as Deputy Pengageng KHP Nitya Budaya entrusts the conservation and restoration work of the two precious paintings to Michaela Anselmini, an Italian restorator who now lives and opens a restoration studio in Indonesia. He was committed to repairing damage without changing the original paint that was written by Raden Saleh. Apart from age and accidents, damage to the paintings by Raden Saleh of the Yogyakarta Palace is also caused by improper maintenance and handling. For this reason, during his two months at the Yogyakarta Palace Painting Museum, Michaela will also teach how to treat the paintings to Abdi Dalem so that the work of conserving these paintings can be carried out sustainably. 0 Response to "Raden Saleh Painting Restoration"